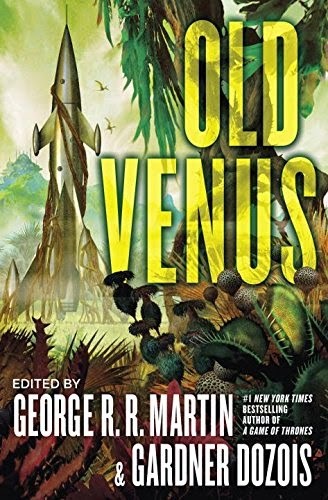 Just published in the US, the anthology Old Venus, edited by George R.R. Martin and Gardner Dozois. A collection of stories, including my 'Planet of Fear', set on the mythic steamy, swampy version of the second planet from the sun before those pesky space probes revealed the truth. Meanwhile, it occurs to me that we need something similar to describe features peculiar to the urban landscape. There are already some - the Oxford dictionary, for instance, has recorded the variety of regional variant names for alleys. But we need more. Words for the plastic bag caught in the branches of a tree (as opposed to the plastic bag caught on the razor-wire of a security fence), the ring of green algae that grows at the bases of street lights and traffic signs in winter, the water that lurks under a loose paving stone. The temporary freshet that wells from a broken water pipe. The weeds that crack through concrete. The weeds that grow at the seam between pavement and wall. The hump in tarmac raised by a tree root. The wind that skirls down the side of a skyscraper. The gleam of low winter sun on a glass curtain wall. Those things inhabitants of cities unsee every day, because as yet they lack the vocabulary to make them a permanent part of the urban experience. A piece on alien invasion films on Entertainment Focus. A short essay on crime and science fiction over on We Love This Book. Another short essay, this one on friendly aliens, on Games Radar. And over at SF Signal, Alvaro Zinos Amaro asked me a few questions.